Former Judge Ian Richards, the son of a mechanic and registered nurse, grew up in South Florida. He attended Shadowlawn Elementary School in the heart of Liberty City, and later graduated from Norland Senior High School. Richards earned an accounting degree from Florida International University and received a scholarship to the University of Miami's School of Law. Richards began his legal career as an intern with the Broward Public Defender's Office. After receiving his Juris Doctor, He went on to become a Prosecutor with the State Attorney's Office where he handled hundreds of cases in misdemeanor-domestic violence, juvenile, and felony courts. In his years of private practice, Richards defended the rights of his clients in real estate, felony, misdemeanor, landlord tenant, and immigration cases. Richards is a member of the Parent Teacher's Association, a local gospel choir, Florida Bar Association, Broward Bar Association, Urban League, and Rotary Club. Prior to taking the bench former Judge Richards volunteered to teach seminars in practical contract and business law at the enterprise community center (ECC) to help small and minority businesses develop. He gave presentations for commissioner Barbara Jordan's District forum, he volunteered to mentor young attorneys taking the Bar, assisted in the citizenship drives, and took pro bono cases. Richards was the president of his homeowner association in charge of revitalizing his community. In addition, Richards volunteered to live with and took care of formerly homeless elderly in a state certified facility for more than two years. 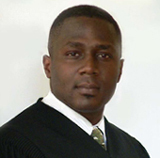 Former Judge Richards was elected to the bench in 2008 and is the first African-American judge to win a countywide election in Broward County. He presides over civil and criminal cases in the South Regional Courthouse and previously served in the domestic violence unit. Former Judge Richards was the only misdemeanor domestic violence court judge in Broward County from January 2009 to January 2013. As a domestic violence judge he handled one of the most delicate and dangerous divisions in the County. Richards was also the Domestic Violence Felony back up judge and one of a select group of judges handling temporary injunctions for protection against domestic, dating, repeat, and sexual violence. Former Judge Richards took the bench with one of the highest criminal caseloads in Broward County. He ordered early participation in domestic violence classes, mental health counseling, and drug/alcohol programs to make families safer. He implemented an innovative trial strategy and brought all cases to trial within 90 days, while giving every party an opportunity to be heard. Together with his dedicated staff, former Judge Richards was able to streamline the domestic violence unit by lowering the caseload from 1,100 to lower than 500 active cases and reduced victims/defendants' wait time for trial by almost half. Former Judge Ian Richards has earned a reputation for being "very fair" and "very patient" (Miami Herald, 8/23/2012). Richards also presided over one of South Florida's most highly publicized hearings in which former Judge Richards jumped over his bench to protect a female witness who was being attacked by her ex-boyfriend that she just testified against (American Bar Association, 03/25/2009). Former Judge Richards maintains a strong commitment to his community. He regularly addresses schools, churches, and mentors local youth. Richards assists in local school activities, such as book-bag giveaways, career days, essay writing contests, youth football camp, and high school sports programs. He facilitates Broward High School Mock Trials and Rotary Scholarship interviews. In addition, he invested thousands in the website (www.IanRichards.org) to help young adults become more aware of available internships and scholarships. Former Judge Richards was honored by Alpha Kappa Sorority, Legacy Magazines, Zeta Youth Summit, and Hot105 Radio as a trailblazer. Former Judge Ian Richards is a loving husband and proud father of one daughter and two sons ages 10, 4, and 2. His wife of 12 years was a cardiac registered nurse at Memorial Hospital and is now a freelance registered nurse and medical translator. Former Judge Richards believes: We make the constitution work by giving all parties a fair and public trial.